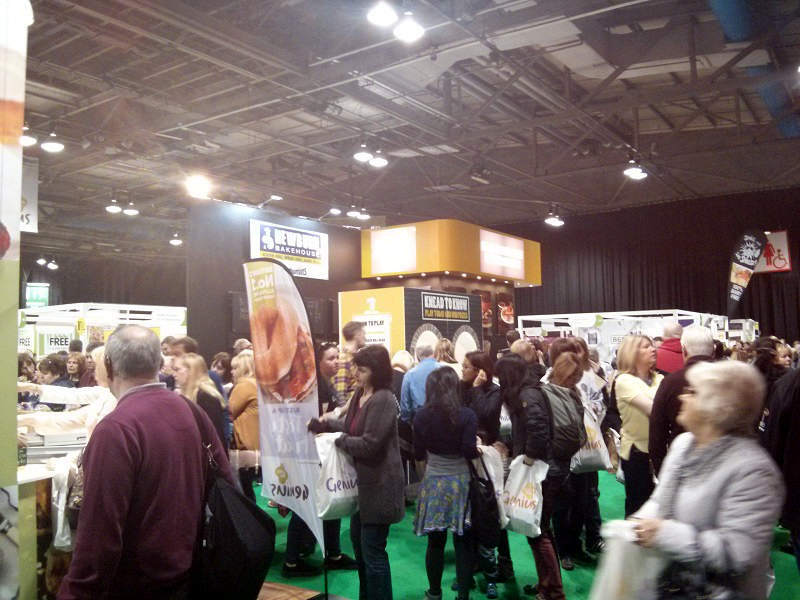 I attended The Allergy and Free From Show – Scotland, held March 19 and 20 at the Scottish Exhibition and Conference Centre (SECC) in Glasgow. 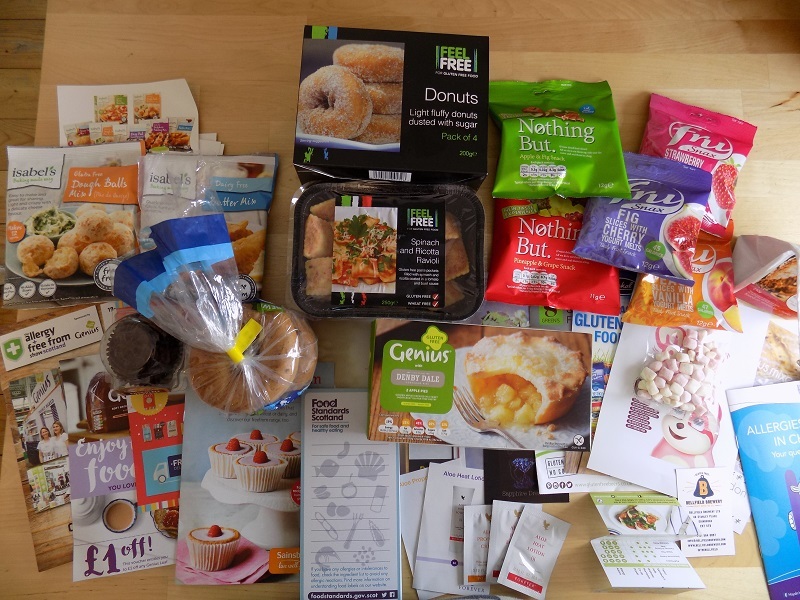 The Glasgow Allergy Show featured samples and products available for purchase from 89 businesses, ranging from bakeries to soy cheese makers to breweries. Attendees could also participate in workshops and cooking demonstrations. 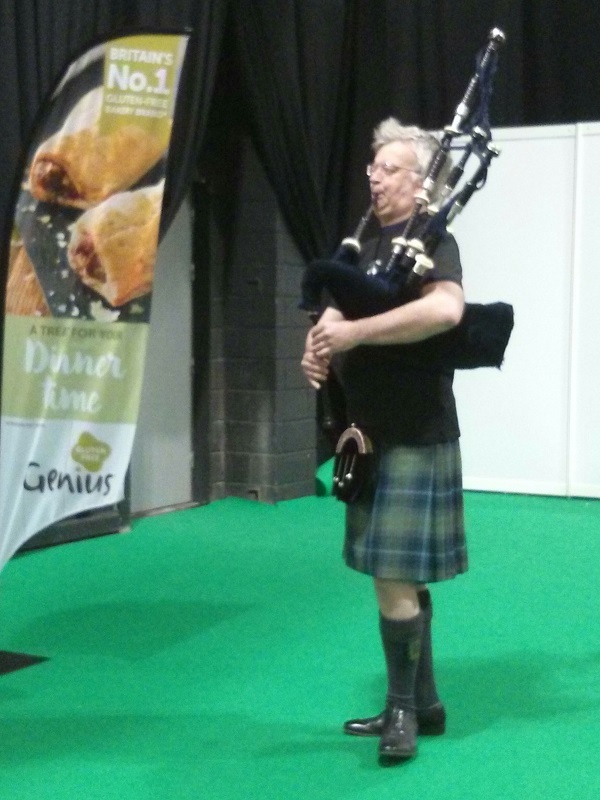 We were greeted by a piper when we entered the exhibition room. I started my day at 9:45 in the queue to get in the front door. While waiting in line, I was handed a Genius gluten free cupcake and a bag with a bunch of information and a notepad inside. Then, just as they opened the doors at 10 to let everyone in, I was given a sample of a gluten free lemon poppy seed muffin (I believe that was also Genius.) The early crowd entered the exhibition space to the sound of bagpipes – pretty perfectly Scottish. I headed for the back corner of the large space and systematically made my way through each row of displays. My theory about avoiding the crowds worked for about the first hour, but then it started to get jam-packed and hard to walk through the room. I did manage to see everything (I think) and made some new brand discoveries, as well as found some old favorites on hand. Here’s the best of what I tried at the event! Launched in 2004 by a woman with a coeliac diagnosis, this gluten free brand offers a wide range of mixes, pastas and frozen foods. I follow them on Twitter and made it a point to find them after they announced they had frozen ravioli. They followed that up with the announcement that they’d be making fresh donuts on site. I had to go, right? I tried the fresh donuts (amazing) and picked up a box of frozen donuts and a box of frozen ravioli to bring home. I’ve already eaten most of the donuts but I’m saving the ravioli for a special occasion. The frozen donuts are not quite as magical as fresh (obviously) but they’re pretty good. I haven’t had donuts or ravioli since going gluten free, so I’m happy to have both items back in my life! This company was launched by a Brazilian woman living in the United Kingdom. Her original intent wasn’t to be a gluten free brand, but that is where she’s ended up. Her Brazilian heritage led her to use cassava (tapioca) flour in many of her products. Isabel’s makes mainly bread mixes, but also stocks a sauce and a few baking ingredients on their website. I tried the dough balls, which are actually Brazilian favorite pão de queijo. I bought that mix, along with a mix for batter which I plan to use to try making onion rings. 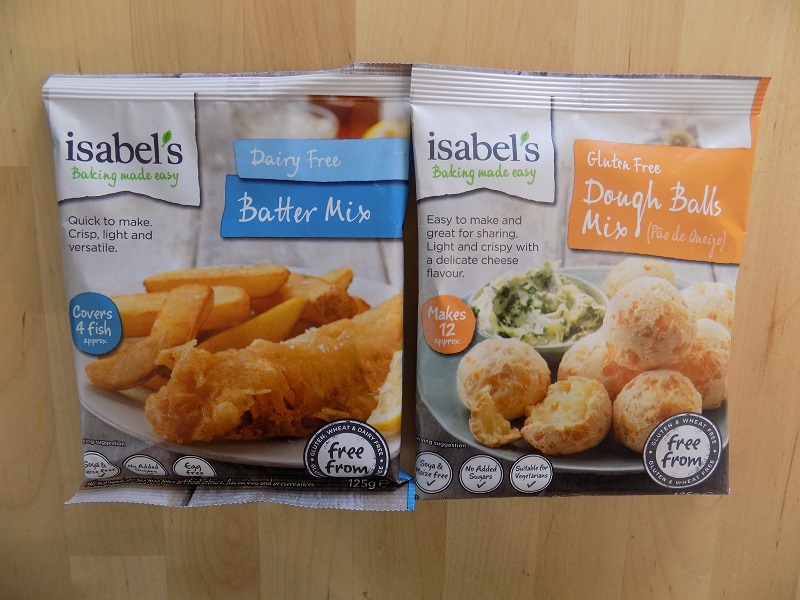 Isabel’s products can be found in Asda, Morrison’s or online from their website directly. Shipments to the UK mainland have free shipping on orders over £65 with standard delivery service. Isabel’s website indicates that their items will ship to the United States as well. Nothing But makes a range of freeze-dried fruit and vegetable snacks. I skipped the vegetables, but tried some of the fruit snacks. The pieces are a bit bigger than what I’ve seen in other freeze-dried fruit snacks, which made them nicer to eat. Plus, they have a range called Fru, which is freeze-dried fruit plus little dry yogurt bits that melt in your mouth. I picked up a few packs for an upcoming trip. Nothing But products are available at Holland and Barrett and Lloyd’s Pharmacy. Rana’s offers a few varieties of bread mixes. I picked up a bag of the Italian bread mix after sampling it at the show. One thing I like about this range is that you just add warm water to the mix – it’s not complicated. Plus the bread was crusty and flavorful. I’m looking forward to making this, possibly for fondue night. Purchase these mixes directly from the company’s website. Genius was one of the event sponsors and had a huge set up just at the entrance to the exhibition room. They had their full range on display, which was great because I discovered a few new things. First, they just launched bagels, so I picked up a bag of those. They are smaller than your usual American bagel and pretty dense, but they’re not bad. I’m glad to have an option, because I can’t eat Udi’s bagels and that’s all I ever see here! I also picked up some frozen apple pie, because I’m never going to make that. The package comes with two mini pies. I look forward to it! 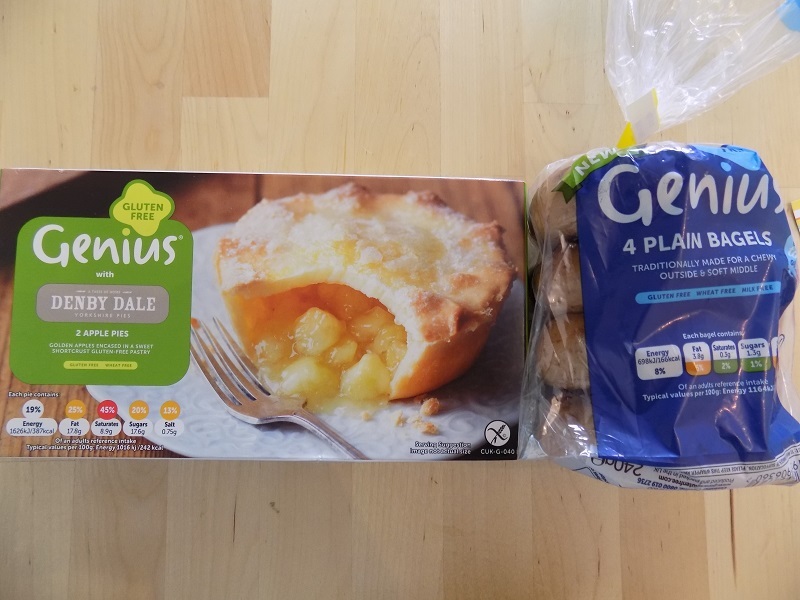 Genius products are widely available in most major supermarket chains in the UK. I’ve already professed my love for Dr. Schär products, so this should come as no surprise. Their booth was full of people all morning and it was hard to get close. I did manage to snag a sample of a cream cracker, because I’d never had one before and wasn’t sure what it was. I still don’t know how to describe it – a cross between a Saltine and a Ritz cracker (Saltine flavor/Ritz texture) maybe? I didn’t buy anything at the event because I know I can find the products in stores. Dr. Schär products are widely available at Morrison’s, and should be pretty easy to find in other supermarkets in the UK. You can also buy Dr. Schär products in grocery stores in the United States. This was another booth that was absolutely swamped with people from the beginning of the day. They had a lot of samples out, but I only managed to get close enough to try one. It was their Onion and Herb flatbread and it was awesome. Too bad I never see it in the stores around me! It does appear to be available via Tesco’s website, so there’s still hope for me. The crowds were getting a little too big by the time I left! There were a few gluten free beer brewers on hand on the day, but I want to give gluten free beer its own feature. 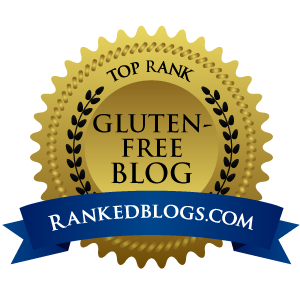 I’m planning to contact a few of the beer gurus I met at the event to try to really get the story of gluten free beer brewing. Look for that article soon! 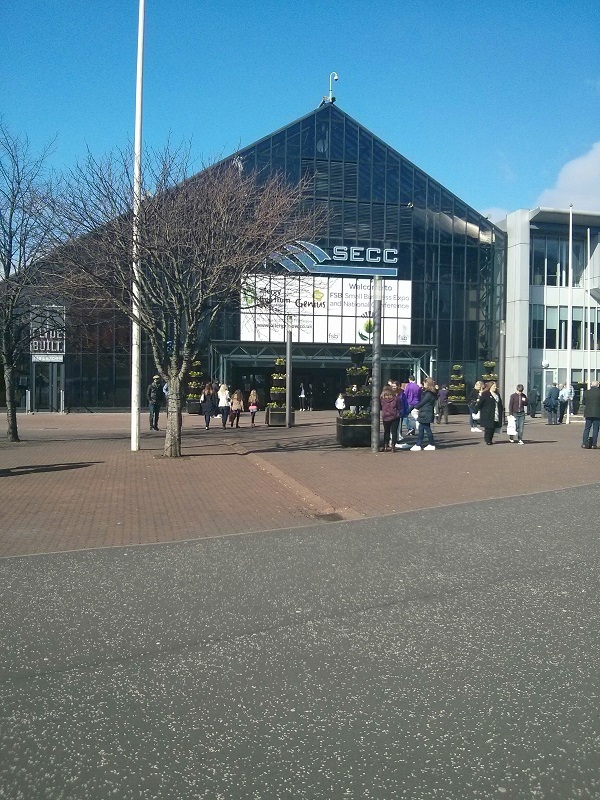 All in all, attending the Glasgow Allergy Show was a really good experience. I got to learn about several brands that were unfamiliar to me and meet several interesting and passionate people in the industry. I will admit that the crowd size was overwhelming by the end, but it was still worth doing. Have you ever been to an allergy show, or other food-themed exhibition? Do you have any tips for success at this kind of event? Tell me in the comments! Great post … i made the fatal mistake of going at 12 midday …bedlam!! Ah, it was about 12 when I left on Saturday and it was indeed bedlam. Did you manage to find anything new and exciting? I tried some good cakes but didn’t want to fight my way back over to buy the mixes in the end.